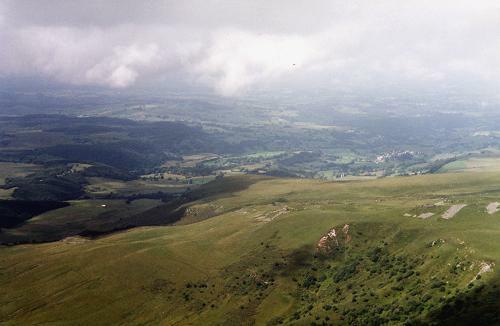 I did think of walking all the way to Egliseneuve but as we were not in any great hurry, we decided to take it easy. 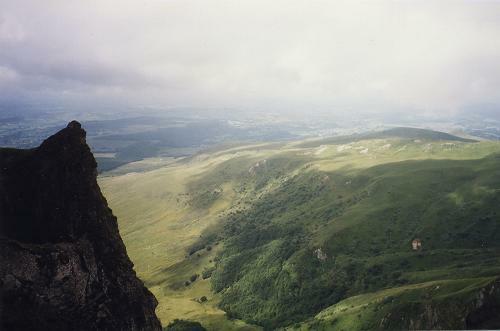 Mind you walking all the way up the Puy du Sancy is no easy matter! It would be more pleasant if the damage caused by downhill skiing was less evident. 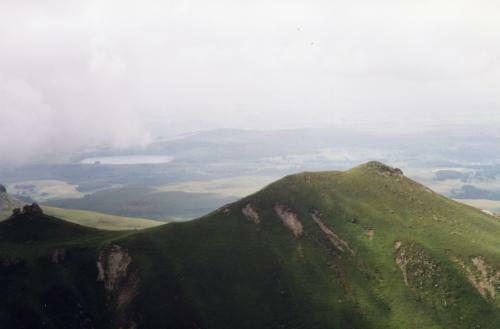 It took us 1½ hours to get from the hostel to the summit of the Puy de Sancy - a very hard slog. I found it a lot harder than A. I, of course, had the heavier burden; but he is getting very fit. At the telepherique station is a pains-taking exposition of the difficulties of maintaining the mountain environment in the face of the touristic (especially skiing) pressures. Very French - it looks like someone's Ph.D. transferred to a series of notice boards. I wonder how many tourists read the notice boards, turn round and go back down the hill, chastened by what they have read! But certainly skiing, and the services the skiers demand, make a very great mess of the mountains. But at least the French restrict skiing to certain parts of the mountains. 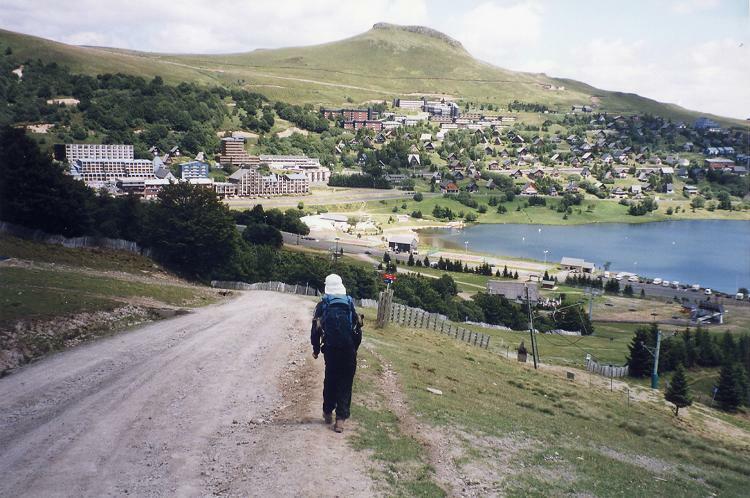 The hostel is in a very good position for getting into the mountains, but it is not a place of beauty. It seems mainly geared towards skiing - I suspect that is when it is really full. As it was, we had a room with beds for seven, for just the two of us. We had a friendly welcome and the most economical stay of our trip. Well worth going back to. It was misty at the top with tantalising glimpses of where we will be heading in the next few days. Also it was very crowded. The weather was a lot better than yesterday and the telepherique had been busy for longer. We had a snack and set off for Super Besse. 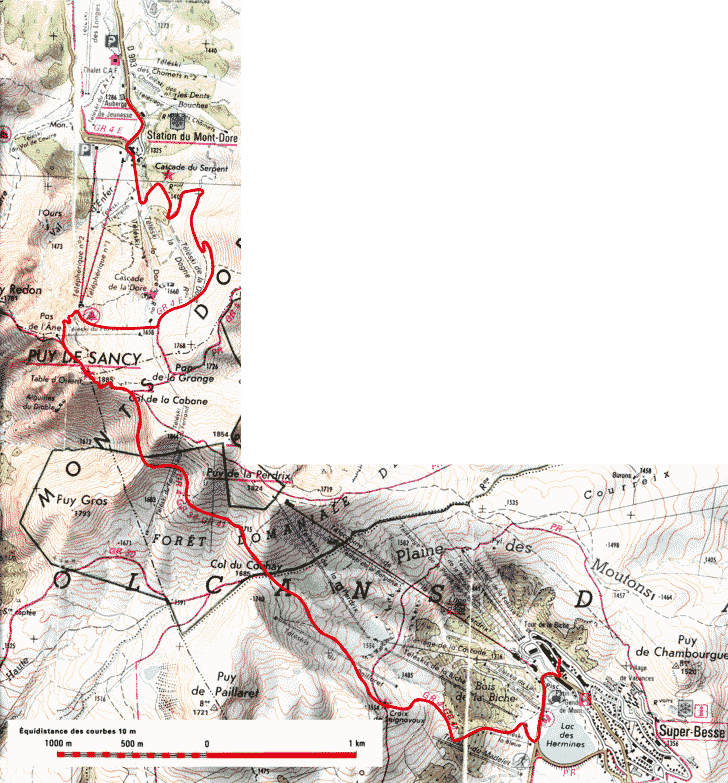 I was using the Tourist Office map which is a simplification of the IGN 1:25,000 and as a result we got confused. 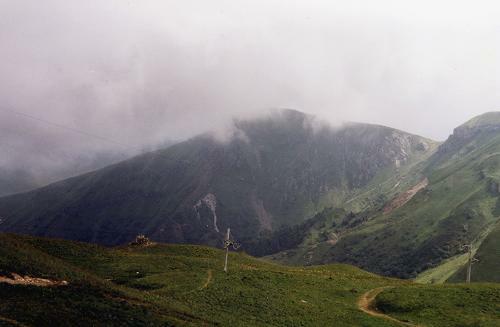 I thought we were at Croix de Seignavoux when we were really at Col du Couhay and so corrected what was not a mistake and took the wrong path (which wasn’t on the map anyway). In all we lost an hour before we were back to doing what we had been doing anyway. We saw some sheep - apparently these hills were used as summer pasture by the farmers in the neighbouring lowlands. 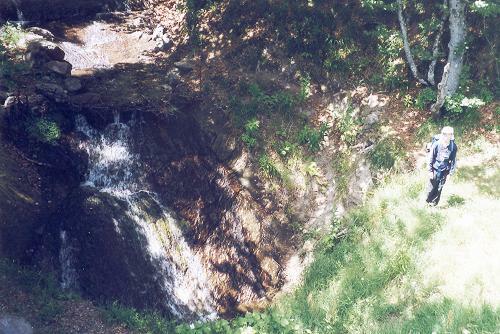 They would live in the hills during the summer months and go back to the villages in the autumn. 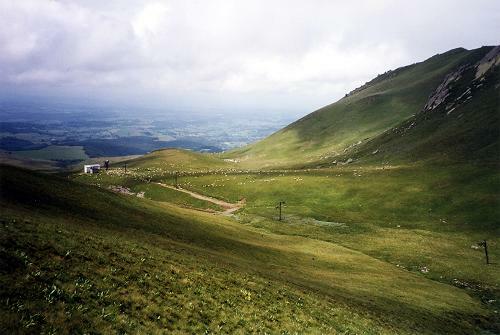 A system known as transhumance The hills between Le Mont Dore and Super Besse are crowded with people. 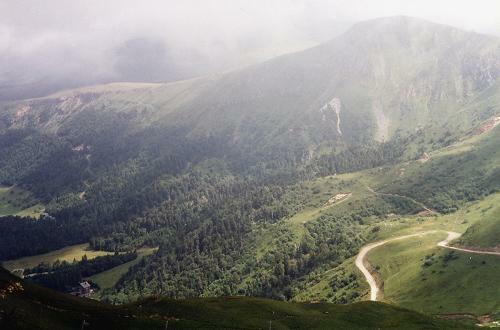 Most come up by telepherique from Mont Dore and Super Besse and go down the same way. We felt full of pride at having walked up. 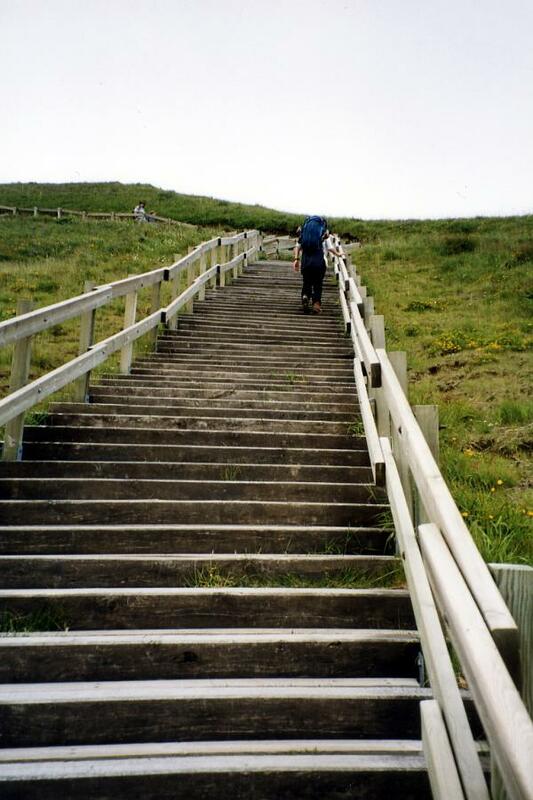 It certainly takes a great deal of will-power to forgo the easy way up. 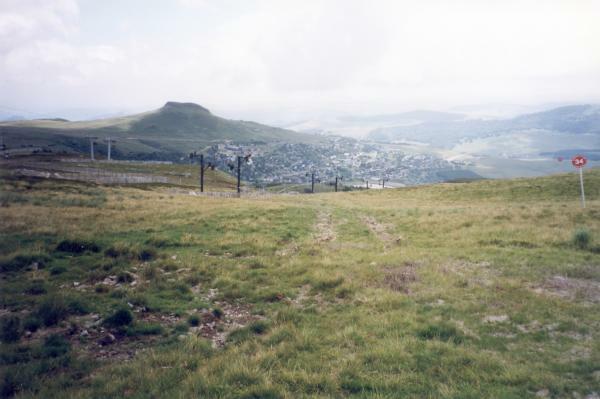 Super Besse is an artificially created town. There was nothing there before the government said that it should exist. In summer most people seem to be either day trippers, from not very far away, or to have flats or holiday homes in the place. Certainly very few of them were in the hotels. We got to Super Besse at 3 and quickly and easily got a hotel room, rested showered, did a washing. Walked round town, got A a pain au chocolat, and two slices of pork for tomorrow. Dined well at the hotel and so to bed. Super Besse gets its name because it is above (super) Besse en Chandesse, an old village a few miles away, farther down the valley. 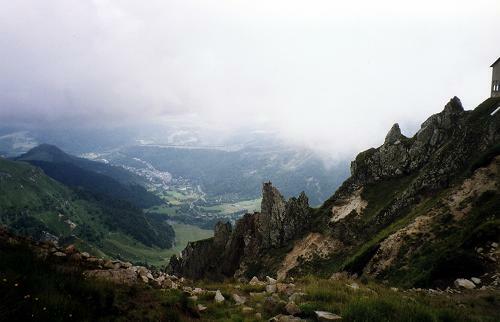 View near the top of Sancy Another view near the top of Sancy Lac Chauvet - tomorrows walk!